I decided to change things up this week and search Betty Crocker for a recipe. -In 1-quart saucepan, cook rice in water as directed on package, omitting butter. -Meanwhile, in 12-inch nonstick skillet, place pork, mushrooms and onion; sprinkle with garlic powder. Cook over high heat 4 to 6 minutes, stirring frequently, until pork begins to brown. Stir in soup and stir-fry sauce; heat to boiling. Stir in pea pods. Cook over high heat 5 to 7 minutes, stirring occasionally, until pea pods are crisp-tender. 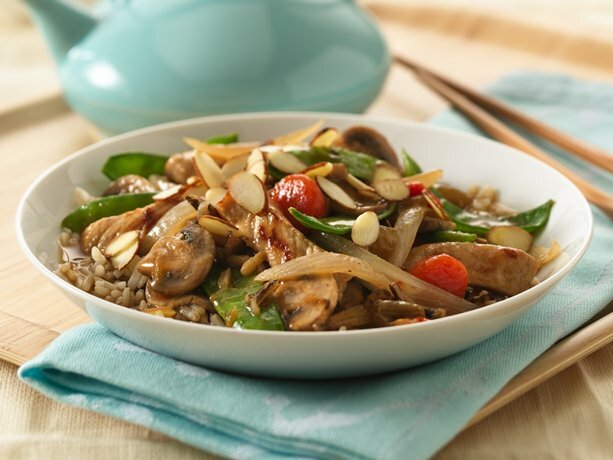 -Serve pork mixture over rice; sprinkle with almonds.